I think it is to each his own here. I will be hitting the road tomorrow in my F250 with cloth seats. Leather is not for my behiney and I do not give a flip about the looks or status. 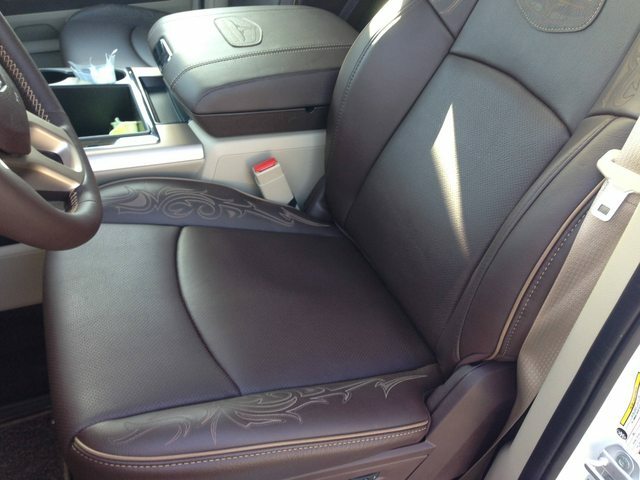 Same seats in my Laramie, as the ones in 12V98, and all I can say is that its one ,and done on those leather seats. IMO they are not comfortable, pretty yes ,comfortable ,no . My seats in my previous truck a Ford Superduty 350 were cloth ,and again IMO a lot more comfortable then this 2014 Ram I have. Thought I needed leather interior, I thought wrong in my case . Other options I would rather spend my money on . My son has a 2016 Ram Bighorn cloth interior, by far more comfortable then my Laramie. "Relaxation is what the whole experience is all about." I think it would be unsafe to be more relaxed. That Long Horn badge on the back of the seat looks like it's a real pain! And I don't like large side bolster seats on long trips. I am with you, not the seats for me, same seats as in my Laramie, just more leather on the Longhorn . We have a short bed, how many folks are running an auxiliary tank with a short bed? I’m not sure if there’s enough room for a smaller auxiliary tank forward of the hitch? I am running a short box F250 with crew cab. Got a 42 gal aux in the front of the bed. It takes up about 1/2 the space between the hitch and the front of the bed. I know this is an older thread, but wanted to push out some info on this. Keep in mind that some States don’t allow for an in bed auxiliary tank to be tied into the fuel system. Texas is one of those States. I know there are plenty of shops that are happy to do it for you, but it’s not legal. With that being said, most officers in Texas are not aware of this law. I have been in law enforcement for nearly 20 years and never knew that, or really had a reason to look. I found out from an Agent with the Comptrollers Office. If you don’t know who they are, ther are the revenuers that keep you from importing goods from low sales tax states into Texas. So, you may find some State Troopers that are aware of this law, but most local and county officers have no clue. Please cite the regs that say it's not legal to run a auxiliary diesel fuel tank that is tied into the fuel tank in Texas. I believe you may be misinformed. The only thing I've ever seen about auxiliary fuel tanks that feed into the OEM tank reference only "commercial vehicles". I can find no references anywhere for Texas. I will admit to being wrong, if I am. But I honestly don't think Texas has any such laws for non-commercial vehicles. short bed here 35 gallon i believe is the listed cap. and plenty of room between the tank and hitch. On my 2015 F-350 short bed it’s a 26 gallon tank which is absolutely pathetic but it is what it is so I’ll be adding an auxiliary tank, just want to be sure there’s room. At the moment I’m torn between the ATI 30 gallon tank which doesn’t take up much room & leaves room for storage on top or a tool box set up with 40-60 gallons. The reality is that I’ll probably never need more than 30 gallons & I barely use the truck unless I’m towing so not sure about keeping fuel in the auxiliary tank long term.